The TOTO Vespin II Washlet+ C100 toilet and bidet system offers an array of features designed to instantly upgrade the quality and comfort of your toileting routine. The Vespin II toilet features a generous 1.28 gallon flush along with TOTO's forceful Tornado Flush Technology and ultra-smooth CeFiONtect bowl glaze that help keep the unit free from residue and build-up. 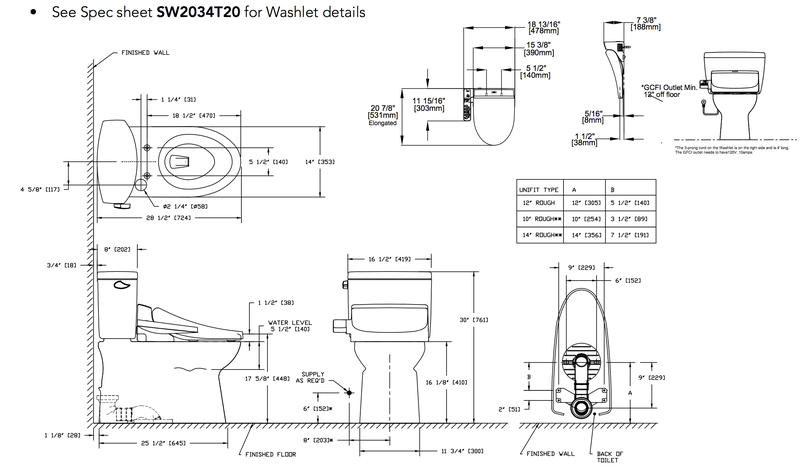 In addition, the Vespin II toilet was designed to specially accommodate Washlet+ bidet seats like the C100 Washlet+ and is able to hide the bidet’s cords and hoses from view for a seamless, streamlined look. The TOTO C100 Washlet+ offers all the features needed for a comfortable and thorough wash and dry experience. The seat offers three wash modes—front, rear and soft rear—as well as an oscillating spray option that moves the wand back and forth for wider wash coverage and additional relaxation. The C100’s water temperature, water pressure, and wand position are all adjustable, and the tank water heating system provides a limited amount of warm wash water. While the tank holds plenty of water for a standard wash cycle, it may run out if the bidet is used several times in a row or when running a long wash. If that happens, the unit switches to using room temperature water until the tank can refill and reheat, which usually takes a few minutes. Thanks to the C100’s built-in warm air dryer with adjustable temperature settings, you’re no longer dependent on costly and abrasive toilet paper for drying off, and the seat’s deodorizer automatically turns on each time the seat is used to get rid of unwanted odors. The C100 is operated via a side arm control panel attached to the side of the seat, and an energy saving mode reduces its electricity draw when it’s not in use to conserve resources and save you money over the long haul. With all the features you need for an effective and comfortable cleansing experience, the TOTO Vespin II Washlet+ C100 toilet and bidet system provides an excellent introduction to the world of quality bidets.